During my senior year, I continued French through OHG, with the teacher Margaret Piper. 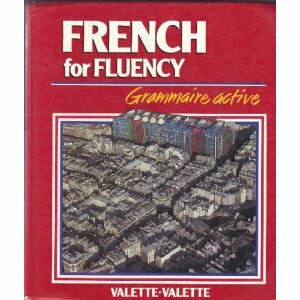 For this forth, year we used the book French for Fluency by Valette and Valette. The class ran through both semesters, and met weekly. This year was different from the previous three because we used a totally different book. Our assignment each week was still to study the current lesson and answer the homework problems within it. However, in class our routine changed slightly. First, Margaret would answer any questions we had about the assigned materials. After questions, she would go over the next lesson and explain the general concepts. Then we would take a aural comprehension test. Margaret would read a passage and we would have to pick the correct answer from a multiple choice sheet, which was written all in french. We would then spend the rest of the class periods reading short french stories aloud. Either trading paragraphs or taking the roles of specific characters in the stories. By thoroughly reviewing the lessons, completing the assignments, and participating in class I learned more vocabulary, more about french grammar, how to conjugate more irregular verbs, how to use the le passe simple construction, how to use adjectives/adverbs, the future tense; and more complex pronoun, infinitive, and subjunctive usage.